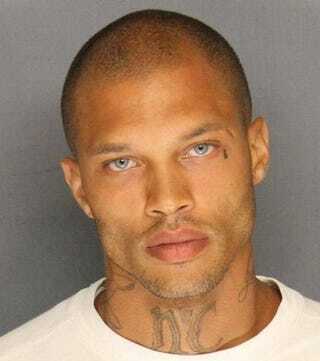 Handsome felon Jeremy Meeks’ plans to turn his viral mugshot into an enterprising endeavor may have hit a snag after his manager allegedly received death threats, TMZ reports. For reasons that have not yet been made clear, the manager reportedly has received about 30 harassing phone calls from so-called “gangster-sounding people,” TMZ reports. One caller reportedly threatened repeatedly to blow her head off, saying she deserved to die, the report says. She reportedly filed a report with the L.A. County Sheriff’s Office. Meeks, a former member of the Northside Crips gang, told Inside Edition last week during an interview at the jail in Stockton, Calif., that he has turned his life around. He told the show that he left gang life seven years ago and now works in a warehouse for minimum wage. He says he's a devoted husband and father of two kids. His mugshot went viral last week after he was arrested on weapons and gang-related charges. And while his good looks may set certain heart thumping, police describe him as a “violent street terrorist,” TMZ reports.